Pop Shop Market co-founders Andrea Espach and Ashley Kane at their Fairfield Theater Co. venue on the market's first anniversary Sunday. 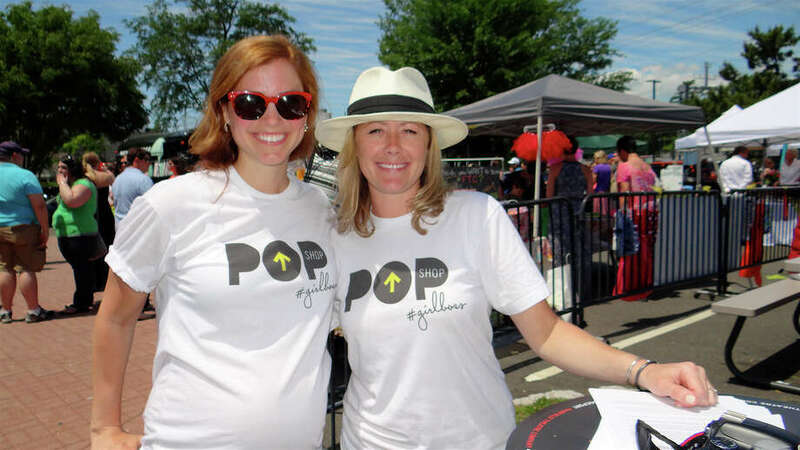 Marking the first anniversary of the downtown Pop Shop Market, the one-day-only venue of various vendors sprang to life under bright skies Sunday in the parking lot of the Fairfield Theatre Co. Founded by partners Andrea Espach, Ashley Kane and Kelly Scinto, the Sanford Street setting featured dozens of vendors offering products from olive oil and organic muffins to jewelry and clothing to home decor. Other highlights included Elle Sera and John Reid performing music, several food trucks, crafts for children and cocktails for adults.